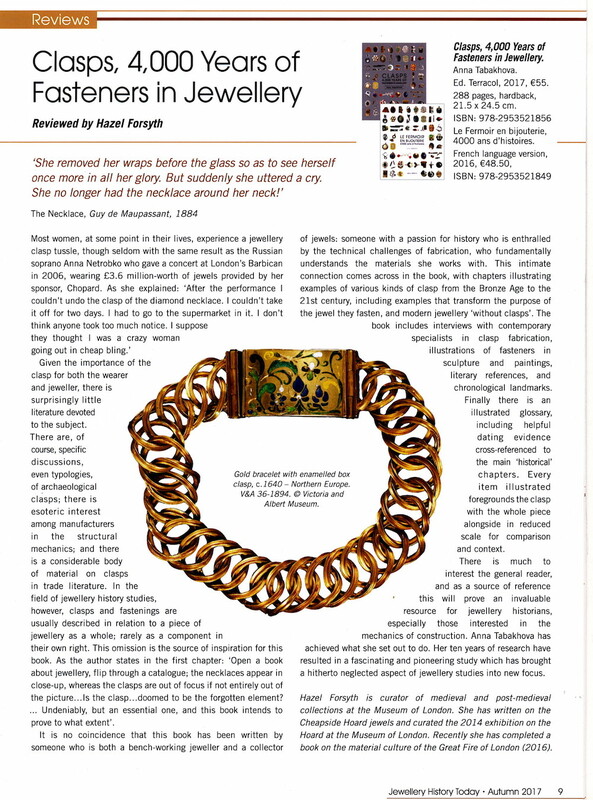 Clasps… a book by jeweller and historian Anna Tabakhova, which is sure to become the standard work of reference on the subject. …invaluable resource for jewellery historians... ten years of research have resulted in a fascinating and pioneering study which has brought a hitherto neglected aspect of jewellery studies into new focus. Marie Chabrol's interviewed the author (in English and French), who is she ? Why did she write the book? wonderful work noticed by the French as international industry jewelry. quite 300 pages highly documented and illustrated, the author allows us to discover a work made for jewelers, students and lovers of jewels. a reasonable price for this amazing book.